I always say your skin is your biggest organ, and that you shouldn’t put something ON your body if you wouldn’t put it IN your body! That’s why I LOVE that Hynt Beauty’s whole line of products are made only nature’s finest botanical ingredients, including one of my favorite superfoods…. açaí! Açaí berries are an amazing, healthy treat from the rain forests of Brazil. Their main claim to fame is having more antioxidants than blueberries, raspberries, cranberries or other antioxidant-rich foods! Antioxidants are molecules found mostly in brightly colored fruits and veggies that protect your cells from damaging free radicals. This damage can contribute to various chronic diseases such as cancer, and is also what makes your skin prematurely age! Açaí berries also have healthy fats and fiber, which help improve digestion, prevent heart disease and help you loose weight! 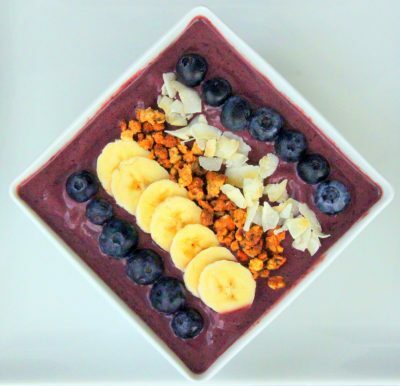 Açaí berries are great used in your beauty-care products to nourish and support healthy, glowing skin AND are a healthy and delicious addition to smoothies and smoothie bowls! 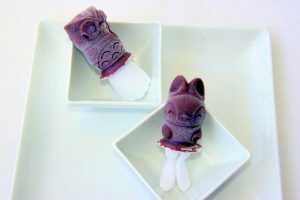 Or… if you have a toddler, açaí ice pops! It’s also super easy and fast to make. Just blend, top and enjoy! Blend “bowl” ingredients together until smooth. Top with granola, fresh fruit or berries, or other toppings.